You will love our Bacon Cooker. Perfect bacon has never been easier or more healthy. Get crisp bacon without a drop of grease on it. Simply load bacon around the top of the bacon cooker. Drape a damp paper over all and cook in the microwave for about 1 minute per slice. Clean-up is a dream. Pour grease out as normal, rinse well in hot tap water and place in your dishwasher. You'll never hesitate to make bacon for any meal ever again. Cooker measures about 7 inches high and 7 inches across with handle and drip well at the base. 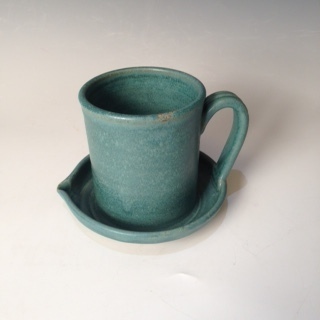 It is made of durable stoneware and sealed with high fire glaze that never scratches.